wonderful trip to this real world fantasy that is tailored to your specific interests. Clockwise from top: 1. Charles Bridge, Prague; 2. Havelski Market, Prague; 3. Tram Car and the Chain Bridge, Budapest; 4. 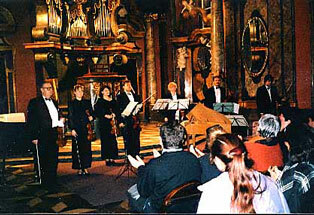 Concert in the Chapel of the Mirrors, Prague; 5. Sally with Tour Guide, Peter Kovacsi, Budapest; 6. 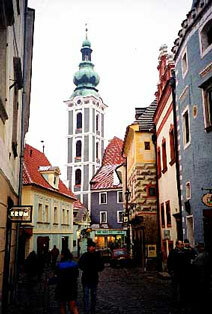 Town Center, Cesky Krumlov, Czech Republic; 7. Parliament Building, Budapest from Fisherman's Bastion; 8. Astronomical Clock, Old Town Square, Prague. Why utilize a Certified Travel Counselor to help plan your next trip? Take a look at photos of my Amalfi Coast/Sicily trip. How About a Trip to Central Europe? Or Perhaps Always Fascinating Italy? Copyright ©Sally Watkins Travel. 2018 All rights reserved. Websire built & maintained by Critslaen..